West Tanfield is a charming old village on the northern bank of the River Ure in North Yorkshire and is steeped in history. Just outside the village stands the ancient Neolithic monument of Thornborough Henges believed to date from between 3,500 BC to 2,500 BC and described as 'The Stonehenge of the North'. Below the church of St.Nicholas in the heart of the village and underneath the rippling waters of The Ure lies an old Roman crossing point, whilst overlooking the river at this point there stands The Marmion Tower a 15th. century gatehouse, open daily April to September with free entry. The village boasts two pubs, both venerable and historic, each offering a superb selection of food, drink and accommodation. 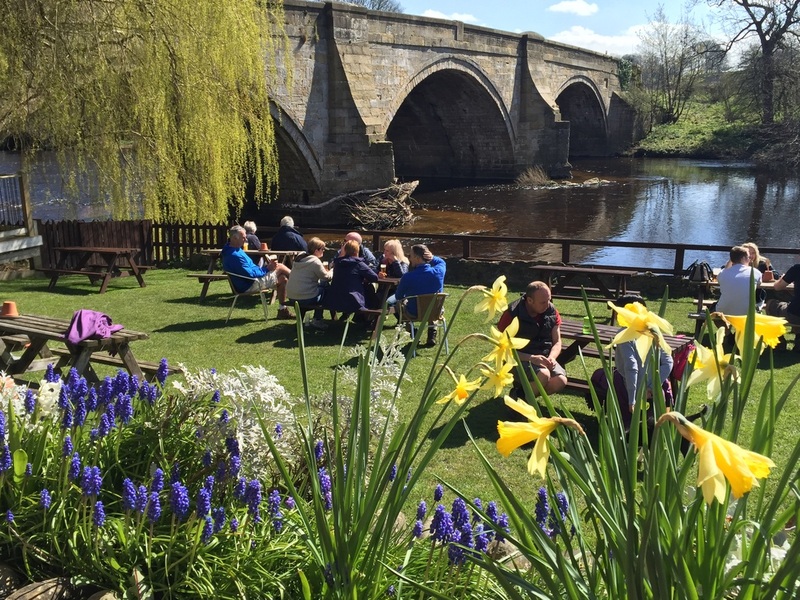 The Bull Inn, nestled beside the River Ure and with a beautiful riverside garden, lies alongside the 18th.century stone bridge. Originally a Ferryman's Cottage and restored in 1699, the Bull Inn is a quintessential English Pub full of character and charm and offers an excellent range of local cask ales, traditional home cooked food and five cosy letting rooms, all with en suite. Voted 'Yorkshire's Favourite Pub' in 2016, the Bull Inn offers a traditional English pub experience in all its glory. The Bruce Arms is an 18th. century coaching inn with restaurant, bar and rooms and offers a glorious sun terrace for summer evenings and comforting log fires in the winter. Serving some of the finest food in Yorkshire, the Bruce has a regularly changing menu together with an emphasis on excellent locally sourced ingredients. ​Extensive Gin, Whisky and Wine collection as well as Cask Ales and bottled Craft Beers. Three excellent double sized letting rooms available. The Bruce Arms was awarded a 'Highly Commended' prize in the Welcome to Yorkshire White Rose Awards in the autumn of 2017, and in April 2018 was judged one of the best three pubs in England in the VisitEngland Awards for Excellence in the 'Tourism Pub of the Year' category, winning a Bronze Award. In the autumn of 2018, The Bruce Arms also won 'Restaurant of the Year 2018' in the 'Flavours of Herriot Country Awards'.